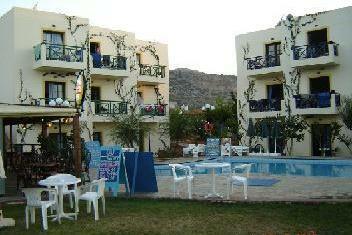 Milos Studios is situated in the outskirts of the lively Malia resort entertainment center. The complex is surrounded by trees and flowers and extensive lawns of grass, ideal place for relaxing and quiet holidays with good food/drinks services. They are efficiently managed by Maria who leaves on site. A self catering small family run complex, with option for Bed and Breakfast. It is suitable for singles, couples, families and small group of friends who are looking for a quiet holidays and good value for money accommodation. A variety of choices regarding restaurants, tavernas, coffee shops as well as supermarkets are within walking dinstance. The entertainment center is only 500 meters away with plenty of bars and clubs. Golden sandy beaches are within walking distance of 500 meters. Heraklion airport and harbor is 30 km away. Milos Studios enjoys a peaceful location, comfortable accommodation and friendly services.